For weeks now, you’ve been exhausted throughout the day. You’re getting crankier as time goes by without the refreshing sleep you need. You’re tired of getting up throughout the night to use the bathroom, and you’re annoyed by headaches that hit you as soon as you wake up. What could be wrong? From listening to these signs, it sounds like you might need sleep apnea treatment in Freedom, WI. In this post, learn about this serious condition and find out what your dentist can do about it from the team at Dental Expressions. This disorder is the second most common sleep issue behind insomnia. Most patients deal with obstructive sleep apnea – in this condition, the airway becomes blocked while you rest. As you sleep, your tongue and jaw relax, and then slide back against your throat, preventing you from breathing properly. Since your brain is smart enough to know that you aren’t getting enough oxygen, it will wake you up, but only enough to cause you to resume breathing correctly – not enough to make you realize you’re awake. These “micro-arousals” can happen hundreds of times a night, leaving you exhausted in the morning, but without knowing why. This condition has many signs and symptoms – some are so common that people often overlook them. Review the list below, assess your risk factors, and take this sleep apnea quiz to see if you may be suffering from this sleep disorder. 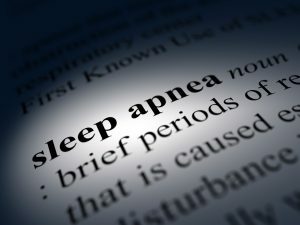 How Risky Is Untreated Sleep Apnea? What Are The Dental Treatment Options For Sleep Apnea? If CPAP isn’t for you, we can treat your sleep apnea in Freedom, WI with Custom Oral Appliance Therapy (COAT). You’ll wear a 100% custom device that looks similar to a nightguard. COAT will gently shift your tongue and lower jaw out of the way to keep your airway open when you sleep. This dental sleep apnea treatment is less expensive, much more comfortable, and extremely effective – oral appliances work for about 80% of patients. Now that you know what sleep apnea is, and how dental treatment can help, schedule your appointment with Dental Expressions today – we’ll help you sleep like a baby again!